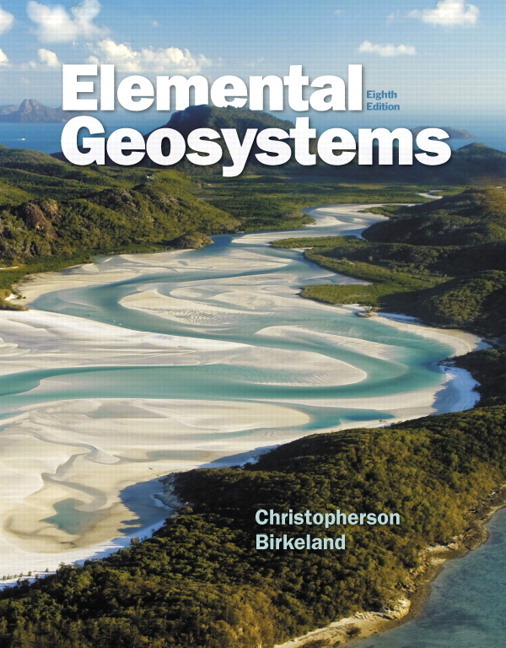 Among the most highly regarded textbooks in physical geography, Robert Christopherson’s best-selling Elemental Geosystems is known for currency, accuracy, rich integration of climate change science, and a dynamic multimedia program. Organized around the natural flow of energy, materials, and information, subjects are presented in the same sequence in which they occur in nature — an organic, holistic approach that is unique in this discipline. The Eighth Edition includes a unique new standalone chapter on Climate Change that presents the history and evidence of natural and human-caused climate change. The Eighth Edition also features new MasteringGeography activities, streamlines and focuses essential content, and incorporates more visual media, active learning, and visual tools to help student engagement and mastery. MasteringGeography is an online homework, tutorial, and assessment product designed to improve results by helping students quickly master concepts. Students benefit from self-paced tutorials that feature immediate wrong-answer feedback and hints that emulate the office-hour experience to help keep students on track. With a wide range of interactive, engaging, and assignable activities, students are encouraged to actively learn and retain tough course concepts. NEW! GeoTutor Coaching Activities coach students on the toughest topics in physical geography and employ kinesthetic and visual tools of Mastering. NEW! Applied Physical Geography activities contain new Pre- and Post-lab coaching activities related to the revised 9th edition of the lab manual. NEW! Geoscience Animations are popular 2-D media that help students visualize various physical geoscience processes, including newer HTML5 animations from oceanography. NEW! Video Activities tied to science and process issues are relevant to the thematic chapters from sources such as BBC, FT, and NASA. NEW! Encounter Physical Geography Google Earth activities that take students on tours of Earth’s virtual landscape to explore the patterns and processes of our world’s physical geography. UPDATED! MapMaster interactive maps contain a robust integration of physical geoscience maps, offering GIS-like activities for assessment and self study. Map Projections media help reinforce and remediate students on basic but challenging early map projection concepts. Assess students in real time, using open-ended tasks to probe student understanding. Understand immediately where students are and adjust your lecture accordingly. Improve your students’ critical-thinking skills. Access rich analytics to understand student performance. Add your own questions to make Learning Catalytics fit your course exactly. Manage student interactions with intelligent grouping and timing. NEW! Dynamic Study Modules allow your students to study on their own and be better prepared to achieve higher scores on their tests. The Mastering course links to physical geography specific Dynamic Study Modules. NEW! Standalone Climate Change Chapter presents the most up-to-date and comprehensive coverage of climate change science and data, including the 2013-2014 IPCC 5th Assessment Report. The chapter covers paleoclimatology and mechanisms for past climate change, climate feedbacks and the global carbon budget, the evidence and causes of present change, climate forecasts and models, and actions we can take to moderate Earth’s changing climate. EXPANDED!¿ New Photo Sources are integrated throughout for a more current, dramatic, and international coverage. NEW! Fluvial Geomorphologist Ginger Birkeland joins Elemental Geosystems as co-author. Part Openers emphasizing the themes of systems, climate change, and human-Earth relations integrate key visuals and topics from associated chapters, giving students a broad overview of the concepts from that Part’s chapters. Geosystems Now: Chapter-Opening Case Studies draw readers into each chapter by discussing interesting, current, and relevant applications of chapter concepts while integrating discussions of systems, climate change, and human impacts. Critical Thinking active learning questions/activities integrated throughout each chapter give students the opportunity to stop and apply/check/practice their understanding of chapter concepts, and also provides students with ways to practice being responsible consumers and citizens of Earth. GeoReports: A variety of factoids, examples, applications, and student action items are interspersed at the bottom of the pages, often related to systems, climate change, and human impacts on the environment. NEW! Geosystems in Action appear as two-page foundation figures and cover key concepts central to each chapter in a visual and process-oriented way. Each GIA includes QR links to open source mobile media.. Active learning questions appear on page and in the MasteringGeography item library. UPDATED! Strengthened Geography Fundamentals in the introductory chapter give a more applied overview of the Scientific Method and the place of physical geography within the discipline and vs. human geography. The unique Earth systems approach organizes the chapters around atmosphere, hydrosphere, lithosphere, and biosphere, following the natural flow of energy, materials, and information to present topics in the same sequence in which they occur in nature. An unparalleled visual program includes a variety of illustrations, photographs, and composites. Over 400 photographs were composed in the field during expeditions by the author and his wife specifically for use in the text, providing authentic examples and applications of physical geography and Earth systems science. 200+ embedded URLs are integrated throughout the chapters, allowing students to link directly to source material. QR Links to Animations and Videos provide just-in-time reinforcement for mobile users as they read, giving instant access to visualizations from robust science sources such as NASA/JPL, FEMA, and NOAA. NEW! The Human Denominatorone page end-of-chapter feature explicitly focuses on the human-Earth dimension of physical geography within context of the chapter topic. Includes maps (spatial data), real-world examples (photos), and review of both current and potential future issues that help engage students by connecting physical geography concepts to their real world environment. UPDATED! Active Applied Physical Geography content and data allow students to participate and engage in the content rather than just read. In select chapters, new Visual Analysis Features challenge students with explicit critical thinking exercises, which can also be assigned in Mastering. Christopherson's focus on relevance speaks directly to students, intriguing them with interesting case studies and factoids from history, science, and current news. Geoscience Animation Library, and he led the editorial board of Rand McNally’s Goode’s World Atlas 22e. Ginger Birkeland received her M.A. and PhD from Arizona State University, with a focus in fluvial geomorphology. She taught intro courses at Montana State University and Indiana University, spent time as a research associate at Arizona State, and has spent many years as an outdoor education instructor and commercial river guide. Nevada) for the U.S. Fish and Wildlife Service; geomorphic oversight, technical expertise, and technical editing for the Menomonee River Sediment Study (Wisconsin); geomorphic expertise, and co-authoring of several sections on fluvial geomorphology for reports on bank protection and salmon habitat enhancement for the Integrated Streambank Protection Guidelines and Channel Design Guidelines (Washington).